CoolSculpting® is the only FDA-approved procedure to use controlled cooling to safely target and eliminate subcutaneous fat. The procedure removes stubborn, diet- and exercise-resistant fat safely and effectively without surgery or downtime. This procedure has results that are proven, noticeable, and lasting. You will look great from every angle. 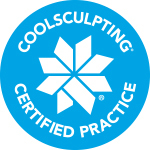 CoolSculpting technology applies controlled cooling to gently and precisely target the fat cells under the skin. These targeted fat cells are frozen and die. Your body will naturally process the fat over time, eliminating the dead cells. This leaves a more sculpted you. Multiple areas of the body can have the fat reduced using CoolSculpting. Additional sessions can be scheduled to enhance your results. Dr. Julie E. E. Kupersmith MD will form an individualized treatment plan that will help you meet your goals for your appearance. As the CoolSculpting procedure is completely non-surgical, most patients can return to their normal activities. As your body processes and eliminates the treated fat cells in the weeks and months that follow, get used to loving your results. Once the fat cells are gone, they’re gone for good. We invite you to contact our office today to learn more about CoolSculpting in New Rochelle, New York, and to schedule a consultation with our cosmetic surgeon.